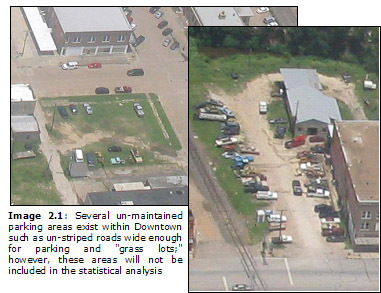 This reported parking problem was briefly analyzed as a component of both Section 14 - Urban Image (Page 14-1, 24-1) and Section 8 – Transportation (Page 8-1) of the Navasota Comprehensive Plan. 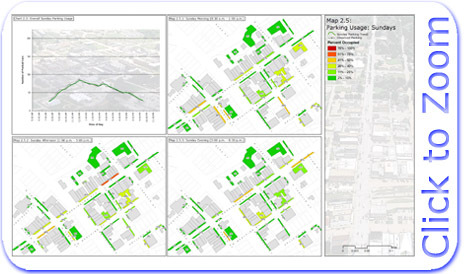 This analysis concluded that sufficient parking was available in Downtown to meet current demands; however, management and allocation of this parking were the principle causes for the observed shortcomings. 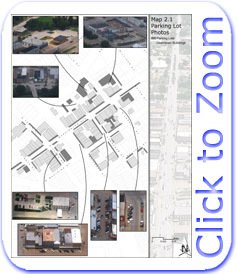 Downtown Navasota contains 535 marked parking spaces (see Map 2.1), Page 11). Design standards for both on and off-street parking groups vary greatly depending on location. It should also be noted that other areas which lack standard parking space striping are occasionally used for parking. However, they will not be represented in the statistical analysis. Examples of these parking areas include grass lots, open pavement areas, or streets which are wide enough to accommodate parked vehicles but lack striped parking (see Image 2.1, Page 9). Some parking lots can also be found immediately adjacent to the study area. The Brookshire Brothers grocery store maintains a large parking lot along the northern boundary of Cedar Creek (see Image 2.2). Other sites with parking lots are also within walking distance of the northeastern extent of Downtown including several churches, a bank, a service station, and a few unimproved grass lots frequently used for parking. Due to pedestrian barriers or inappropriate urban design many of these lots are not presently used by Downtown visitors or employees. Of the marked spaces within the study area, 321 (60%) are located on street right-of-way or are otherwise considered on-street parking. Out of the on-street parking, 288 spaces are head-in or angled parking, with 33 spaces configured as parallel parking. The remaining parking within Downtown, consisting of 210 spaces (40%) in total, is located within 10 parking lots. These parking lots range in size from 6 to 45 spaces each. All but 2 of the parking lots are located behind the buildings they are meant to serve. Ownership of the parking areas in Downtown is primarily held in the public sector. This publicly owned parking includes most on-street parking, however, some private owners maintain parking on the edge of their property and allow direct access from the street. This configuration represents a small percentage of on-street parking, a total of 44 spaces. Ownership of off-street parking is dominated by the private sector with 151 spaces (72%). Virtually all publicly owned parking lots are found in the Cedar Creek Park area, accounting for 50 spaces. Even though most off-street parking is privately maintained, few private entities limit public access to their parking lots. Some posted reserved spaces are found in these lots (see Image 2.3), but at present no pay lots have been established. Just under 60 parking spaces (11%) within Downtown are reserved (see Table 2.1). For example, Wellington Lofts reserves parking on site for residents, while the Postal Office restricts parking in its lot to employees. A few other agencies also reserve parking for specific employees. Map 2.2 displays the locations of reserved and "private" parking within Downtown. In an attempt to limit all day parking the City has erected two hour parking limit signs in some portions of Downtown (see Image 2.4), this restriction applies to just over 100 (21%) on-street parking spaces (see Table 2.1). Map 2.2 shows the locations of time restricted parking. While signs have been posted, the City does not appear to be enforcing the parking limits on a regular basis. Also, parking meters are not currently utilized as either an enforcement of the posted time restrictions or a revenue source for the City. Handicapped reserved parking is provided within Downtown in most parking groups. 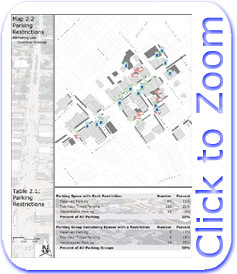 A total of 15 spaces (3%) are spread throughout the on-street and off-street parking areas (see Map 2.2, Table 2.1). Nearly one third of the parking groups contain at least one Handicapped space. During fieldwork for this study, spaces reserved for handicapped parking were occupied an average of 24% of the time during business hours. In most cases the observed occupancy rates of handicapped spaces were at or below the overall occupancy percentage for the group they were within. Also of concern, parking space striping throughout Downtown including some handicapped markings have faded over time (see Image 2.5). Map 2.2 displays the locations of reserved parking of each type throughout Downtown. Table 2.1 displays statistics relating to each type of reservation in terms of both raw parking spaces as well as by parking groups which contain spaces governed by each restriction. In most cases statistical analysis was conducted using "parking groups." These groups are generally contiguous spaces sharing a common configuration and ownership. For on-street parking groups, a single group may contain gaps for curb cuts at alleys or driveways. However, in some cases, on-street parking groups have parking spaces which are used in significantly different ways due to the businesses located adjacent to them. In such cases these parking groups were split at alleys or driveways to account for the very different use patterns. The following sections include an introduction to the primary datasets collected and analyzed for this study. Each portion includes a brief discussion of the overall findings with maps and graphs included for reference. As a mixed-use community center, Downtown Navasota experiences large fluctuations in both through-traffic and parking during the day. Observations on the numbers of parked vehicles were made throughout the fieldwork phase of this study, with a total of 167 observations made between February and December of 2004. A more detailed discussion of the data gathering and sampling methods utilized in this and other sections of this study can be found in the Methodology Section (Page 85). 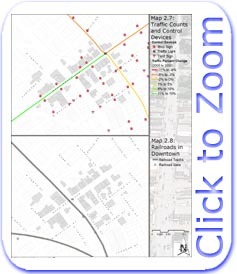 Weekdays are the most heavily trafficked timeframe within Downtown Navasota, with observations indicating that the total parking within the study area exceeds 200 vehicles for several hours before and after lunch. Standard business hours are highly influential on parking patterns. During this time almost half of the parking groups regularly exceed 40% occupancy levels, with six of these groups experiencing over 65% occupancy. A combination of employee and customer parking is observed in most parking areas. On weekday mornings (9:00 a.m. to 11:00 a.m.), on-street parking on East Washington Avenue, Farquhar Street, Railroad Street, McAlpine Street, and Tenth Street is particularly prone to parking shortages (see Map 2.3.2). By contrast, off-street parking lots were observed with mostly low occupancy levels (under 50%), with the exception of the parking lot located behind the Bank of Navasota. 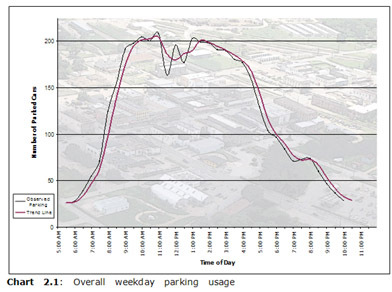 During lunch (11:00 a.m. to 1:00 p.m.), the overall parking pattern (see Chart 2.1) reveals a decrease in parking activity. However, this drop is modest and may represent Downtown employees leaving their parking spaces to run errands or eat lunch at home. 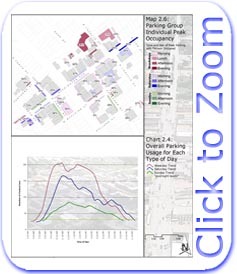 At lunch, parking near each restaurant within Downtown does increase in occupancy indicating that despite the overall drop, lunch traffic in Downtown represents a noticeable overall factor. In general, weekday afternoon parking demand (1:00 p.m. to 5:00 p.m.) produces several areas of parking shortages, to a slightly lesser degree than mornings (see Map 2.3.3). Parking groups experiencing shortages in the morning hours remain consistently occupied; however, these groups have an occupancy which ranges between 5% and 15% lower than mornings. Off-street parking lots also remain easily below capacity in most cases during the afternoons. Parking on weekday evenings (5:00 p.m. to 9:00 p.m.) varies significantly by the day of the week. As would be expected, entertainment and restaurant activities draw higher levels of parking on Fridays than Monday through Thursday. Throughout the week, average occupancy rates are near 25% in the evenings. Some parking groups near Sergeant Pepperoni's, Miller's Theater, and the Filling Station Diner can produce occasional shortages (see Map 2.3.4). Following a brief period of overall increase at 7 p.m., the parking patterns decline to overnight levels of between 20 and 30 vehicles by 10 p.m. (see Chart 2.1). Parking demand on Saturdays tends to follow patterns set by retail sales and entertainment activities. Overall parking demand within Downtown exceeds 150 vehicles for several hours in the morning, with demand exceeding 50 vehicles total throughout much of the day (see Chart 2.2). During the Saturday morning timeframe (8:00 p.m. to 1:00 p.m.), a clear "lunch rush" can be observed with overall peaks exceeding 150 vehicles during this time. Several service institutions also hold business hours on Saturday mornings including the Bank of Navasota and United States Postal Office. Employee as well as customer parking for these institutions causes nearby parking groups to average in excess of 50% capacity. Retail establishments located along Washington Avenue also generate some areas of high parking demand. One parking group in western Downtown exceeds 80% occupancy, with others ranging from the high 30% to mid 60% range (see Map 2.4.1). Overall parking peaks at or near 11 a.m. followed by a gradual decline for the remainder of the day. In the afternoons (1:00 p.m. to 6:00 p.m.), customer driven parking along Washington Avenue shows an increase despite the early afternoon closings of two major service institutions. These closings impact parking in the afternoons, which removes many employees from Downtown. Rear parking lots and side streets remain largely empty and available through much of the afternoon. Occasional Saturday matinee performances held in the Sunny Furman Theatre also impact parking demand on Washington Avenue and Tenth Street, as well as parking around the Video Express movie rental shop (see Map 2.4.2). Saturday evenings (6:00 p.m. to 10:30 p.m.) continue the trend of overall decreases in parking throughout Downtown. Many retail establishments close at or around 6:00 p.m., however, restaurant and entertainment traffic causes a brief spike at 7:30 p.m. Stage and cinema activities also cause spot shortages. Even with most retail establishments closed, parking along Washington Avenue still exceeds 40% occupancy for many parking groups well into the evening (see Map 2.4.3). Parking demand on Sundays appears to be driven by many of the same factors as Saturdays with the addition of religious services in the morning hours (8:30 a.m. to 1:00 p.m.). Parking activity peaks around noon, however, the overall demand for parking was significantly lower than other days of the week, with overall parking demand never exceeding 100 vehicles even at peak (see Chart 2.3). The lunch rush is significantly depressed as compared to Saturdays despite the presence of four churches located within the study area, in addition to several more churches located in the Old Town Neighborhood immediately adjacent to Downtown. This apparent lack of traffic into Downtown for lunch may be somewhat masked by vehicles leaving religious services and the length of time different groups spend at their worship centers. As for supply, five parking groups meet or exceeded 40% occupancy on Sunday mornings (see Map 2.5.1). Four of these groups can be attributed to religious services, with the other providing parking for restaurant activities. Spot shortages of parking were observed near the two churches located in western Downtown, with some parking groups at full capacity during services. However, sufficient parking remained available in other nearby parking areas within an easy walking distance. As with Saturdays, retail and entertainment uses tend to dominate parking on Sunday afternoons (1:00 p.m. to 5:00 p.m.). Despite some overlap between departing church patrons and retail customers, overall parking demand for this time frame only exceeded 60% in one parking group (see Map 2.5.2). The highest demand areas are found along Washington Avenue driven by retail and restaurant activities. Most service and government institutions remain closed throughout Sunday, limiting the impact employee parking has on the overall demand pattern. Observations of parking on Sunday evenings (5:00 p.m. to 8:30 p.m.) reveal few areas with parking problems. Many of the retail establishments also close early on Sundays, however, the departure of employees and customer parking is somewhat offset by dinner and cinema traffic. Some spot shortages were occasionally observed near Miller's Theater, however dinner parking at the neighboring Filling Station Diner begins to decline as movie patrons start to arrive (see Map 2.5.3). Increased capacity at both establishments could be easily accommodated by existing parking. Overnight parking levels are reached around 9:30 p.m. When weekday, Saturday, and Sunday demand patterns are compared side-by-side, the overall use pattern of Downtown is revealed (see Chart 2.4). Parking volume for Downtown as a whole is observed in the greatest quantities on weekdays, averaging over 200 vehicles parked in marked parking spaces for several hours. Morning parking levels surpass nighttime parking (20 to 30 vehicles) at approximately 6:30 a.m. on weekday mornings, with similar noticeable parking activity occurring later on weekends between 7:00 a.m. and 8:00 a.m.
On weekdays and Saturdays employment and retail activities cause a daily peak in parking at approximately 11:00 a.m. A lunch rush is more noticeable on the weekends, with overall parking dropping during this time on weekdays. Following an afternoon peak overall parking begins to decline on all days. Weekdays, heavily influenced by the business day, experience rapid declines beginning at 4:00 p.m., while parking on Saturdays and Sundays declines at a significantly more gradual pace. Evening entertainment activities held on Saturday nights briefly boost parking levels higher than the corresponding weeknight levels. Despite this evening activity, the vast majority of parking appears to occur between the hours of 8 a.m. and 6 p.m. Nighttime parking levels are observed between 9:30 p.m. and 11:30 p.m., with the latest activity occurring on Saturday nights. While overall parking demand is higher on weekdays for the most part throughout Downtown, various parking groups achieve their highest occupancy rates on a variety of days. On Map 2.6, parking groups reaching their peak occupancy on weekdays are drawn in shades of plum, Saturdays in shades of blue, and Sundays in shades of green. Lighter shades of each color indicates the peak is reached in the mornings, while darker shades represent a parking group reaching its peak in the afternoon or evening. As might be expected, most on-street parking located around City Hall, the Police Station, and United States Postal Office are busiest on weekdays, in addition to portions of on-street parking on Washington Avenue and in the large off-street parking lots. On-street parking located near the two theaters and those parking groups primarily serving retail and restaurant land uses, reach their peak occupancy on Saturdays. Three parking groups achieve their highest occupancy rates on Sundays with each group located within close proximity to Downtown churches. While not directly related to parking demand, vehicular circulation within Downtown should be taken into consideration when making streetscape, parking, and land-use decisions. According to the Texas Department of Transportation (TxDOT) a daily average of 9,400 vehicles enter Downtown Navasota using Washington Avenue (Texas Highway 105 West), with between 7,000 and 8,000 vehicles accessing Downtown from LaSalle Street (Texas Highway 6 Business) as of the year 2002. Since the year 2000, traffic on LaSalle Street has decreased by an average of 2.5%, however, traffic on Washington Avenue has increased just under 15% (see Map 2.7). The posted speed limit within Downtown is 30 miles per hour (mph). City and state maintained control devices also impact entrance into and circulation within Downtown. The intersection of LaSalle Street and Washington Avenue is controlled with a traffic light including protected left turns, while stop signs are utilized on other street. The intersections between railroads and all streets within Downtown are signalized and gated (see Map 2.8). Two railroads impact vehicular and pedestrian circulation within Downtown. One of these crosses Washington Avenue at Railroad Street, with the other crossing Washington Avenue on the western end of Downtown at Eighth Street (see Map 2.8). Frequency and cargo information for trains passing through Navasota was not made available during research for the 2004 Navasota Comprehensive Plan. 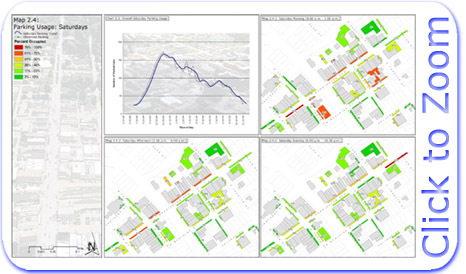 During fieldwork for this parking study some data were gathered to show relevant statistics on train frequency and duration. During an average workday approximately 30 trains pass through Downtown causing vehicular and pedestrian traffic to wait an average of 4.9 minutes for the trains to pass. It should be noted that these statistics are based on extremely limited samples taken during fieldwork for this study and may vary from actual crossings and durations. Also of concern is a recently observed problem with the guard gates when they occasionally remain down for several minutes following the passing of a train. The interaction between train crossings and the Washington Avenue/LaSalle Street traffic light also impacts circulation efficiency within Downtown. During train crossings traffic was often observed backed up several blocks, a problem occasionally exacerbated by the traffic light’s cycles. Using video recorded during fieldwork it is possible to calculate circulation statistics for certain portions of Downtown. On weekdays between the hours of 8 a.m. and 6 p.m., traveling the length of Downtown on Washington Avenue and returning to approximately the same location requires an average of 2.9 minutes. The minimum and maximum times observed were 1 and 7.1 minutes respectively. In terms of speed the half-mile trip averages 9.7 mph with a minimum and maximum of 2 and 21.4 mph, respectively. Both raw observations and hourly averages representing travel time were graphed, however, the graphs showed a relatively random pattern with virtually no relation to known Downtown use patterns. Furthermore, the quickest and slowest trips recorded through Downtown were both observed during peak activity times based on overall parking demand. The most likely explanation for the resulting variability in travel time is the interaction between train crossings and traffic buildup at the LaSalle Street traffic signal. Parking maneuvers using on-street parking spaces may also partially account for the significantly lower than posted travel speed along Washington Avenue. However, many drivers appeared to use the pauses created by red lights or train crossings to pull into or out of parking spaces. Establishing the turnover rate for each parking group is critical for a proper analysis of parking usage. 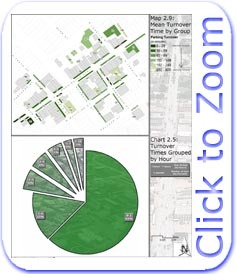 Map 2.9 illustrates each parking group’s average turnover time in minutes. In other words, an average vehicle in each parking group can be expected to remain parked for this length of time without moving. More explanation of the methodology used to determine this statistic can be found in the Methodology Section (Page 85). In short, digital video was shot of each parking space within Downtown at 15 minute intervals throughout several days. Finally, each video was replayed and the results were recorded into the Geographic Information System for later analysis. One would expect a relatively fast turnover with on-street parking as it serves mostly customers for retail, entertainment, and service institutions. As such, a quick turnover rate (a smaller number of minutes and darker color on the map) is desirable to provide parking to the largest number of customers. The average turnover time for on-street parking groups observed in Downtown was 85 minutes. Turnover rates in off-street parking lots averaged 152 minutes. 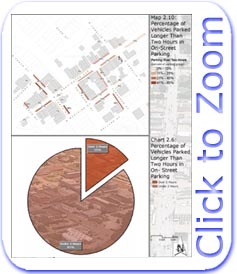 Chart 2.5 shows the overall percentage of vehicles remaining parked in one parking space at various lengths of time. Overall, 77% of the observed vehicles remained in one space less than or equal to two hours, while 23% lingered longer than two hours. Parking groups which may be cause for concern include on-street parking on Washington Avenue between Railroad and LaSalle Streets, as well as on-street parking on Railroad and LaSalle Streets themselves (see Map 2.9). While the average turnover does not exceed two hours in any of these groups, vehicles remaining in parking spaces for long periods of time may frustrate the business and retail patrons when parking is difficult to find. By contrast, several parking groups such as the on-street parking near the Bank of Navasota and those in front of the United States Postal Office had a turnover time of less than 30 minutes. Both of these establishments have large parking lots in the rear, likely providing a location for long-term employee parking. An analysis of the turnover statistics also reveals some interesting facts about the success of the two hour parking limits for on-street parking. Only four of the on-street parking groups which have posted time limits did not have at least one vehicle observed as violating the restriction during fieldwork. On average, 15% of the vehicles parked in these groups remain longer than two hours (see chart 2.6). 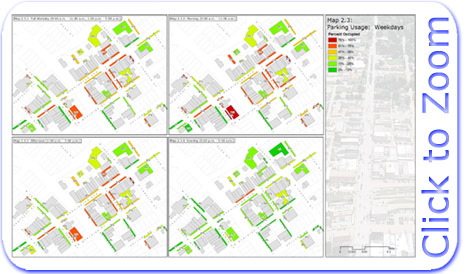 Map 2.10 shows the number of violations for parking groups. Percentages of the vehicles violating the restrictions are labeled with color coding (darker colors) indicating groups with higher occurrences of violations. Along Washington Avenue and Farquhar Street an average of 13% of the vehicles remain parked longer than the posted limit. Possible causes for the numerous violations of parking limits may include sign placement and design. 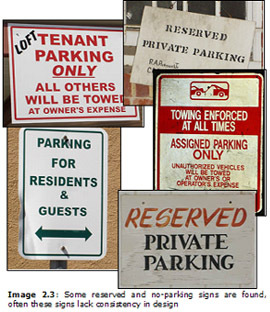 Existing signs lack specific information regarding where the parking limit applies. The signs also appear to suffer from a lack of a "universal" design. Modeling replacement signs after those used commonly throughout Texas may aid in driver recognition. The City does not currently enforce the parking limits on a consistent basis, requiring self-policing of employees by some managers and business owners, however, an increased level of City enforcement through warnings or citations may also be helpful. It is also important to note that many vehicles which were observed in particular parking spaces prior to the standard lunch hour returned to the same space in the afternoon. This activity restarts the clock on turnover statistics; therefore, the turnover time discussed here is not necessarily synonymous with the time any given vehicle spends parked in Downtown throughout the day. In addition to discussions about a general shortage of parking in Downtown, the issue of employees parking in on-street parking was a major topic of discussion during public involvement for the 2004 Navasota Comprehensive Plan. While not inherently negative, employees do tend to spend long periods of time parked in a particular space and can therefore exacerbate the problem of parking supply if shortages are already a problem. Fieldwork to determine where employees typically park was conducted over seven days during October and November of the year 2004. In short, photographs of all vehicles parked in Downtown were taken on each of these days. Using the photographs a spreadsheet was created documenting vehicle make, model, color, condition, license plate number, parking location, and any other identifying characteristics. Any vehicles observed three or more times were classified as employees, while those observed once or twice were classified as customer driven vehicles. Parking areas reserved for residential uses were excluded. As with previous datasets, a complete methodology and results can be found in the Methodology Section (Section 7, Page 85). Map 2.11 demonstrates the employee parking levels as observed in Downtown. Parking groups with higher percentages and darker colors indicate a larger representation of employees than groups with lower numbers and lighter colors. Vehicles attributed to employee parking were observed throughout Downtown. As expected, many of the off-street parking lots in the rear of commercial buildings have a particularly high concentration of employees. Despite this desirable condition, some on-street parking groups located on Washington Avenue, Railroad Street, and Farquhar Street had an excess of 60% employee parking. 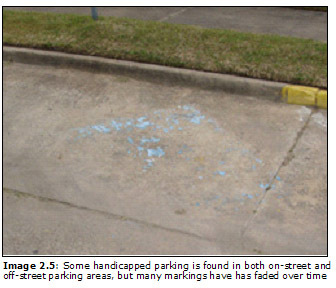 As with turnover, on-street parking groups near the Bank of Navasota and United States Postal Office are dominated by customers, with the associated rear parking lots used primarily by employees. 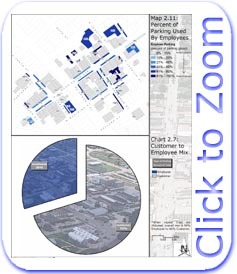 Overall, 30% of the vehicles parked in Downtown were driven by employees (see chart 2.7). While this is a relatively low percentage, employees were more likely to frequently return to Downtown than customers, resulting in an average employee parking percentage of 54% by parking group when repeat trips were tabulated into the overall percentage.